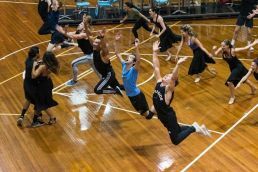 The exceptional cast of performers have an intense rehearsal schedule ahead of them to master the challenging choreography and iconic music in this legendary Broadway musical under the direction of Associate Director and Choreographer Julio Monge. 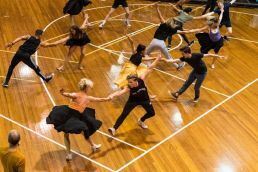 Monge, a former protégée of Jerome Robbins and one of the few choreographers in the world approved to recreate the iconic choreography is excited to be back in Australia following auditions in 2018 to bring his expertise to this brand new production. “I’m so amazed with the incredible passion the cast are already bringing to this piece,” said Monge. 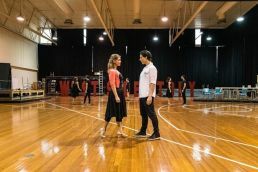 “I haven’t seen hunger like this from a group of performers in years and I can’t wait for audiences to feel that passion when they see the show for themselves.” With 4 weeks until West Side Story on Sydney Harbour opens, the performers are getting ready to rumble in this all new incarnation of the musical, which will be presented on Opera Australia’s purpose-built open-air stage at Mrs Macquaries Point, which is twice the size of most indoor stages. 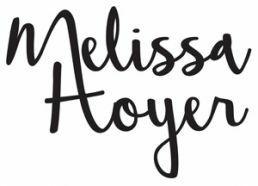 The 42-strong cast includes opera/musical crossover stars Julie Lea Goodwin and Alexander Lewis, who play the leading lovers Maria and Tony, as well as Melbourne-born Karli Dinardo who makes her Australian debut fresh off the back of the US national tour of Hamilton. Also making an Australian debut is exciting Puerto Rican performer Waldemar Quiñones-Villanueva, who has previously performed in West Side Story on Broadway and will play the role of Bernardo. Handa Opera on Sydney Harbour is supported by the NSW Government via its tourism and major events agency Destination NSW and Dr Haruhisa Handa through the International Foundation for Arts and Culture. Minister for Tourism and Major Events Adam Marshall said the NSW Government has been a proud supporter of Handa Opera on Sydney Harbour since its inception in 2012. “Handa Opera on Sydney Harbour has attracted more than 330,000 visitors from over 80 different countries and I know 2019 audiences will enjoy a once in a lifetime opportunity to see one of the greatest musicals of the 20th century in a completely new way,” Mr Marshall said.